Tumor budding (TB) is proposed as an essential step in the invasion and metastasis of tumors and in recent years has attracted interest as a prognostic marker in colorectal cancer, esophageal squamous cell carcinoma and gastric adenocarcinomas.,,, It means the presence of small groups, or single cells, at the invasive front of a tumor, showing no features of differentiation. However, there is limited information about the role of TB in breast cancer. This study was designed to correlate the extent of TB with clinicopathological parameters and hormone receptor status. This study was conducted in the Departments of Pathology and Surgery, Maulana Azad Medical College, and associated Lok Nayak Hospital, over a period of 1.5 years from December 2013 to April 2015. This was a prospective observational study. Patients who received preoperative chemotherapy were excluded from the study. Assessment of TB: Tumor buds were defined as comprising five tumor cells or less at the invasive front of the tumor. For evaluation of TB, H and E section with broadest margin was selected. Immunohistochemistry (IHC) with Pan Cytokeratin was performed as per avidin biotin technique to highlight the tumor buds. Entrapped normal breast tissues within the mastectomy sections were used as an internal control for IHC. 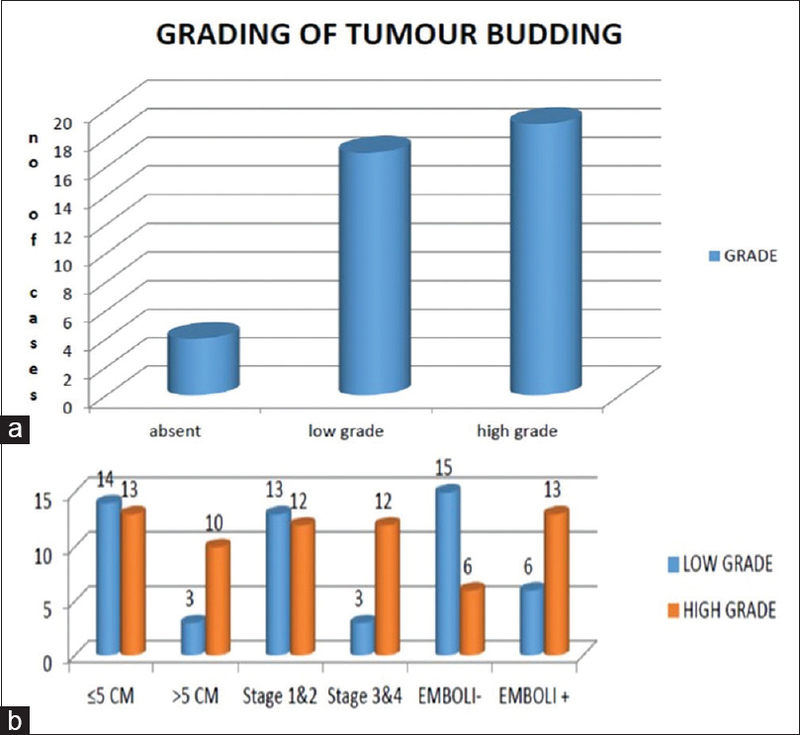 Areas were screened for highest number of tumor buds. Tumor buds were recorded in ×20 objective in each case at invasive front in the stroma. Cases were separated into two groups according to TB density per ×20 field as low grade (<10) and high grade (≥10). Data were then entered in MS Excel sheet. Data were compiled, tabulated, interpreted, and analyzed by Statistical Package for the Social Science (SPSS). An attempt was made to look for any significance and correlation, if any, between TB with established clinicopathological parameters and hormone receptor status. P value <0.05 was considered significant. A total of 40 cases diagnosed as breast carcinoma were included in this study. All 40 cases in this study were newly diagnosed cases, who did not receive any therapy. 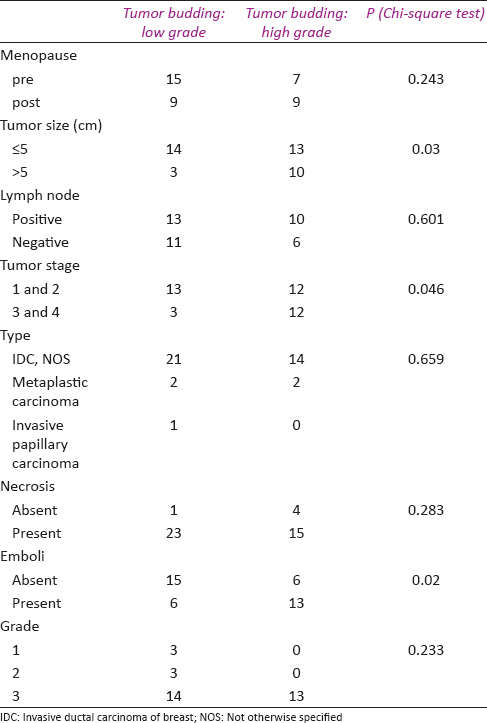 Of these 40 cases, 35 were of infiltrating duct carcinoma, 4 cases were of metaplastic carcinoma, and 1 case was of invasive papillary carcinoma [Table 1] and [Figure 1]. The majority of patients were premenopausal (55%), had small tumor size ≤5 cm (67.5%), had negative lymph nodes (67.5%), had grades 2 and 3 (75%), and presented in stages 1 and 2 pathological stage (62.5%). 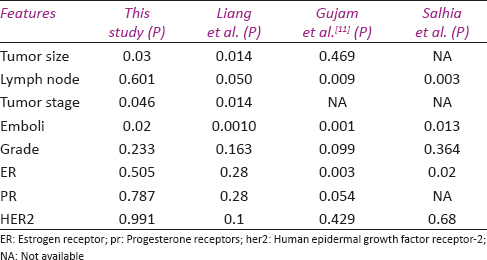 The majority were estrogen-receptor (ER)-negative (62.5%), progesterone-receptor (PR)-negative (65%), and human epidermal growth factor receptor (HER2)-positive (52.5%) [Table 2]. Correlations between the grade of TB [Figure 2] and other clinicopathological variables were determined by Chi-square test as shown in [Table 2], and a P value of less than 0.05 was considered as statistically significant. Higher grade TB was observed in larger tumor (P = 0.03), in higher stage (P = 0.046), and in tumor having lymphovascular emboli (P = 0.03) when compared with small size, lower stage, and tumor with no evidence of lymphovascular emboli, respectively. However, TB was independent of menopausal status, lymph node metastasis, histological type, grade, and hormone receptor status of the tumor. Previous reports have suggested that budded cells in breast cancer displayed epithelial–mesenchymal transition (EMT)-like molecular phenotype. Since EMT endows cells with migratory and invasive properties, TB at the invasive margin was postulated as the first step of invasion and metastasis, which implied that TB would be a more sensitive indicator of aggressiveness when compared with traditional histopathological variables, such as node metastases and lymph vessel invasion (LVI). As TB is a potential oncotarget, more detailed molecular properties of budded tumor cells deserve to be elucidated in the future. The budded tumor cells at the margin had been demonstrated as the poorly differentiated component, which could illustrate the aggressive behavior and adverse prognosis in cancers. This new histological parameter could be used to complement the traditional histopathological prognostic factors in breast carcinoma. According to the guidelines of a prognostic factor study, a potential prognostic factor should first be reproducible and widely available with quality control. To date, consensus on the definition and quantification of TB has not been reached. Besides the counting method proposed by Ueno et al., other criteria, such as the scoring method and the rapid bud count method, were also used. However, despite the lack of standardization, nearly all the reported evaluating systems presented with a good reproducibility, and almost all the studies presented with a significant association between TB and adverse clinical outcome. In the study done by Liang et al., they adopted the counting method and selected the maximal value of five densest budding fields as the number of TB. This method is easy to be implemented and showed a good interobserver reproducibility. Similar to the study by Salhia et al., we used the help of Pan Cytokeratin IHC for better visualization of tumor buds. In this study, TB was low grade (<10) in 21 (52.5%) cases and high grade (>10) in 19 (47.5%) cases. This was in close approximation to the studies of Liang et al. [low grade (66.9%) and high grade (33.1%)] and Gujam et al. [low grade (65%) and high grade (35%)]., However, in the study done by Salhia et al., approximately 80% cases were high grade and 20% were low grade. 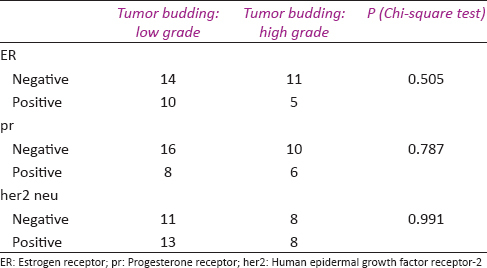 Specimens with high-grade budding were significantly associated with larger tumor size (P = 0.03), higher pathological stage (P = 0.046), and presence of LVI (P = 0.02). [Table 4] compares the findings of our study with the three recent studies published during the course of our study and thereafter. Similarly, in a study by Liang et al., high-grade budding was significantly associated with larger tumor size (P = 0.014) and presence of LVI (P = 0.001), and were marginally associated with presence of lymph node metastases (P = 0.050). They also proved that patients with high-grade budding had a significantly worse overall survival when compared with those with low-grade budding. Since we could not follow-up the patients due to short sample size and a shorter time period of study, we could not relate the grade of TB with recurrence and death of patients. In studies done by Gujam et al. and Salhia et al., TB was associated with adverse pathological characteristics, including lymph node involvement and LVI., Both these studies also found a positive correlation between TB- and ER-positive tumors. If this were to be the case, then it might be expected that anti-estrogen treatment would reduce the degree of budding in these patients. Other studies on TB done in colorectal carcinoma and esophageal carcinoma concluded it as an independent prognostic marker for prediction of recurrence and survival., No statistically significant association was found in our study with other factors such as age, menopause, tumor grade, lymph node involvement, presence of necrosis, and with ER, PR, and HER2 NEU status [Table 3]. In our study, we confirmed the presence of TB in breast carcinoma and its association with known poor prognostic indicators such as tumor size, stage, and lymphovascular invasion. However, there is a need to study the population of budding cells with respect to tumor differentiation (histological grade), proliferation, and acquisition of mesenchymal phenotype (EMT), cell adhesion molecules, and matrix metalloproteinases and hormone receptor status. We recommend TB as a promising prognostic factor in carcinoma breast and it should be included in histopathological reports to complement the conventional prognostic parameters. Gabbert H. Mechanisms of tumor invasion: Evidence from in vivo observations. Cancer Metastasis Rev 1985;4:293-309. Prall F. Tumour budding in colorectal carcinoma. Histopathology 2007;50:151-62. Roh MS, Lee JI, Choi PJ. Tumor budding as a useful prognostic marker in esophageal squamous cell carcinoma. Dis Esophagus 2004;17:333-7. Fulford LG, Easton DF, Reis-Filho JS, Sofronis A, Gillett CE, Lakhani SR, et al. Specific morphological features predictive for the basal phenotype in grade 3 invasive ductal carcinoma of breast. Histopathology 2006;49:22-34. Zlobec I, Lugli A. Epithelial mesenchymal transition and tumor budding in aggressive colorectal cancer: Tumor budding as oncotarget. Oncotarget 2010;1:651-61. Simon R, Altman DG. Statistical aspects of prognostic factor studies in oncology. Br J Cancer 1994;69:979-85. Ueno H, Murphy J, Jass JR, Mochizuki H, Talbot IC. Tumour 'budding' as an index to estimate the potential of aggressiveness in rectal cancer. Histopathology 2002;40:127-32. Liang F, Cao W, Wang Y, Li L, Zhang G, Wang Z, et al. The prognostic value of tumor budding in invasive breast cancer. Pathol Res Pract 2013;209:269-75. Salhia B, Trippel M, Pfaltz K, Cihoric N, Grogg A, Lädrach C, et al. 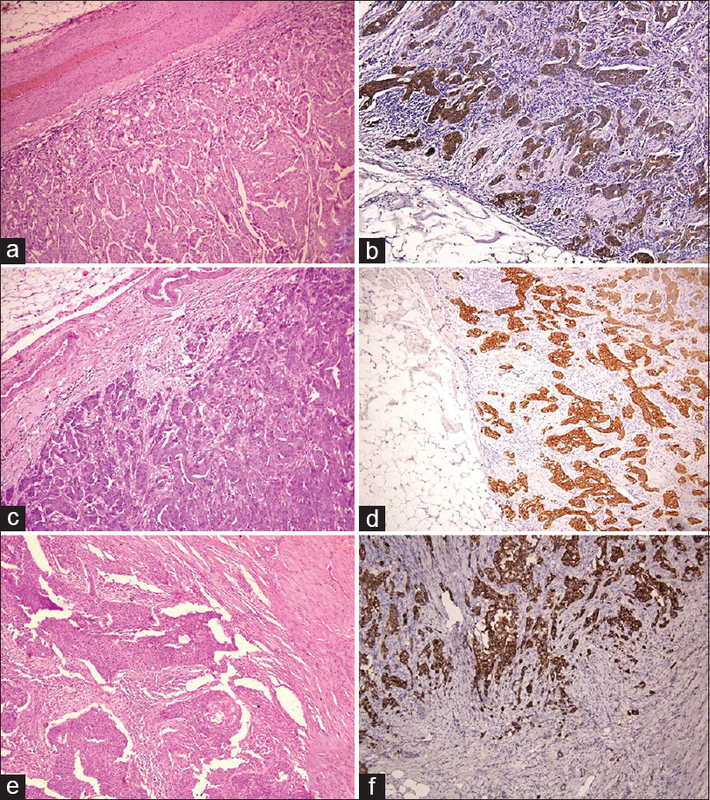 High tumor budding stratifies breast cancer with metastatic properties. Breast Cancer Res Treat 2015;150:363-71. Gujam FJ, McMillan DC, Mohammed ZM, Edwards J, Going JJ. The relationship between tumour budding, the tumour microenvironment and survival in patients with invasive ductal breast cancer. Br J Cancer 2015;113:1066-74.